Who says App stores just have to be for mobile phones? Asus announced today plans to create an app store full of applications designed specifically to be used with netbooks. The store which will open later this year will feature netbook-specific apps and netbook-optimized software designed specifically to work with the pint-sized computers. The app store is essentiall a branded version of the Intel App store which is currently open. The Asus App store will come pre-loaded on Asus netbooks sold later this year. 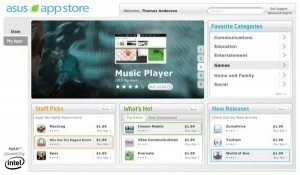 A good app store could put the computers in a better place to compete against other devices such as the iPad/iPhone, and Andriod devices. What do you think? Would you be more likely to purchase a netbook with app store options available?